Take your place on the Rocking Gladiator Joust podium and battle it out to see who can be the last one standing. 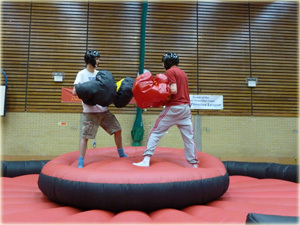 Contestants use oversized foam boxing gloves to try and knock their opponent into the inflatable pit, but beware, the Gladiator Podium will rock from side to side with your every move. It is important to keep your balance while trying to battle with your opponent! 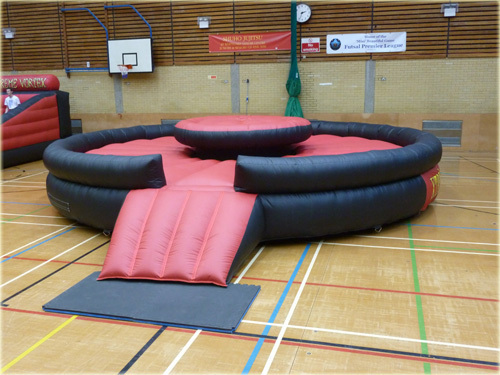 The Inflatable Bouncy Boxing ring can be used for your event to simulate a boxing event through a safe and fun inflatable game.